Two players scored career highs and as SCCC head coach Toby Wynn said, Seward needed it. Neidy Ocuane scored a career high 24 and Brennyn Seagler dropped in a career high 16 as #7 Seward won 83-78 at Cloud. The Lady Saints have won two of the past three at Bryant Gymnasium in Concordia. It was all Cloud early. The Lady T-Birds led 16-5 and 19-16 after one quarter. Cloud bolted into the locker room with a 43-34 lead. But the Lady Saints went to work in the third quarter outscoring the Lady Thunderbirds 24-18 in the third and outscored Cloud 25-17 in the fourth. Ocuane broke a 75-75 tie with a three pointer. 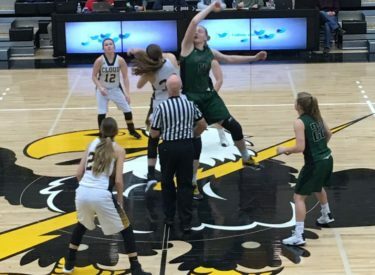 Seward was then able to get a stop and hold onto the ball until Cloud finally reached a fifth foul and fouled Mollie Mounsey who is an 87 percent free throw shooter. She made two free throws to make it 80-75. Cloud made a three to make it 80-78 before Mounsey made one of two foul shots to make it 81-78. Joanna Grymek forced a miss and Mounsey made two free throws to seal it. Seward shot 41 percent while Cloud shot 48 percent. Ocuane hit four three pointers on the way to her 24 points. Seagler made three 3 pointers for her 16. Mounsey scored 23 with eight rebounds. Grymek added 10 points and nine rebounds. Seward is 19-1 and 15-1 in the KJCCC. Cloud is 13-6 and 10-6 in the conference. Seward plays at Barton Saturday at 5:30 with Saints Shootaround at 5:15 on 107.5 and kscbnews.net.